The OMB-DBK40 has been discontinued. Please contact our Data Acquisition department for possible substitutes. 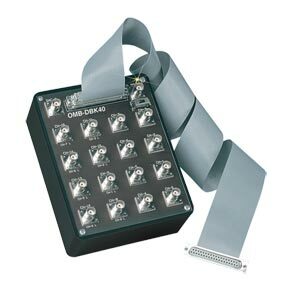 The OMB-DBK40 provides a convenient means of attaching analog signals from BNC cables to the OMB-LOGBOOK and OMB-DAQBOARD-2000 Series data acquisition systems. The OMB-DBK40 features eighteen BNC connectors that accommodate sixteen analog input channels and two analog output channels. One of the OMB-DBK40’s BNC connectors can be switch-selected as either the TTL trigger input or as the second analog output channel. The OMB-DBK40 features a male DB37 connector that mates with the OMB-LOGBOOK or DAQBOARD P1 analog I/O connector. The OMB-DBK40 also accommodates the five counter-timers when attached to the DAQBOARD P3 connector. The OMB-DBK40 includes a 1.8 m (6') cable for attachment to an DAQBOARD P1 analog I/O connector or to an DAQBOARD P3 I/O port. Attachment to the DAQBOARD P3 further requires the use of an optional OMB-CA-60 adaptor cable.